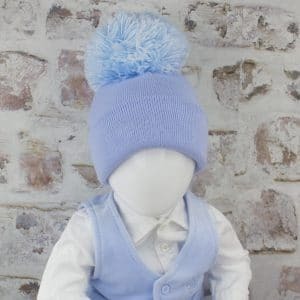 This truly magical Blue Baby Pom Hat will make a cute and essential addition to every baby boy's winter wardrobe. Featuring a blue baby beanie hat couple with a large blue pom. This gorgeous hat can also be personalised with your little boy's name for a memorable keepsake. Please checkout the full product description for our hat's size measurements! This simply adorable Grey Baby Pom Hat will make an essential addition to every baby's winter wardrobe. 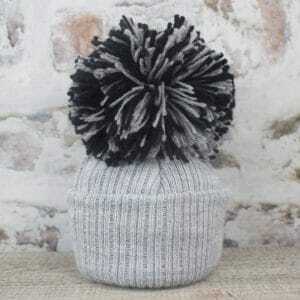 Featuring a grey baby beanie hat coupled with a large black & grey pom. This gorgeous hat can also be personalised with your little one's name for a memorable keepsake. Please checkout the full product description for our hat's size measurements! 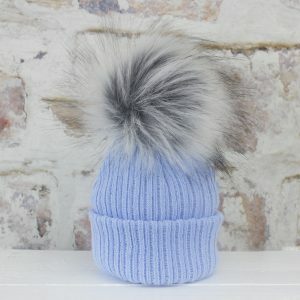 This stunning blue baby fur pom hat is the perfect way to keep every baby boy's head warm during the cold winter months. 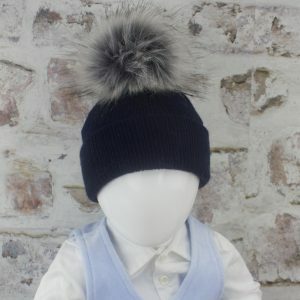 This is a traditional blue baby beanie hat that features a grey fur pom, which can be personalised with his name for a lasting keepsake. Please see our full product description for sizing details. This adorable blue fur pom hat will make a cute addition to every baby boy's winter wardrobe. Showcasing a smooth design, it is finished with a white faux fur pom. This charming hat can also be personalised with your little mans name for a memorable keepsake. Please checkout the full product description for our hat's size measurements! This stunning grey baby fur pom hat is the perfect way to keep baby's head warm during the cold winter months. This is a traditional grey baby beanie hat that features a grey fur pom, which can be personalised with baby's name for a lasting keepsake. Please see our full product description for sizing details. This super cute navy fur pom hat will make an essential addition to every baby boy's winter wardrobe. 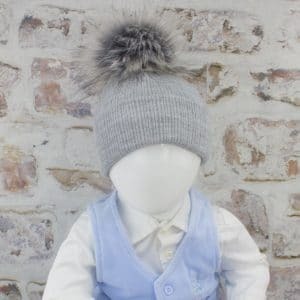 Showcasing a smooth design, it is finished with a grey fur pom and this delightful hat can also be personalised with your little mans name for a special keepsake. Please checkout the full product description for our hat's size measurements! This stylish pink baby fur pom hat is the perfect way to keep baby's head warm during the cold winter months. 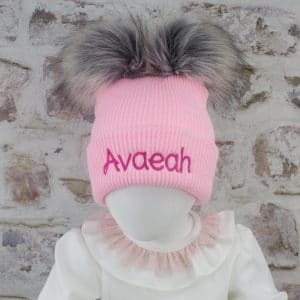 This is a traditional pink baby beanie hat that features a grey fur pom, which can be personalised with baby's name for a lasting keepsake. Please see our full product description for sizing details. Our white winter baby hat is the ideal way to keep your little one nice and snug this winter, featuring a delightful double pom alongside the white baby beanie hat for a stylish finish. This charming gift can also be personalised with baby's name for an extra special keepsake! Please checkout the full product description for our hat sizing guide! 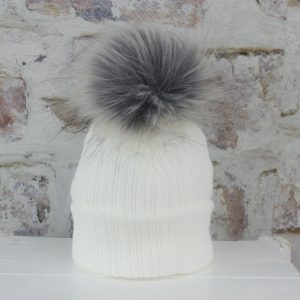 This gorgeous white baby fur pom hat is the perfect way to keep baby's head warm during the cold winter months. 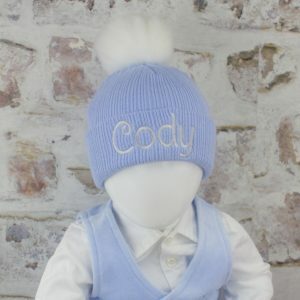 This is a traditional white baby beanie hat that features a grey fur pom, which can be personalised with baby's name for a lasting keepsake. Please see our full product description for sizing details. 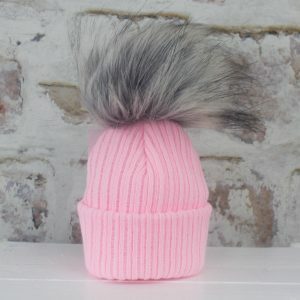 Our delightful pink winter baby hat is the ideal way to keep your baby girl nice and warm this winter, featuring a gorgeous double grey pom alongside the pink baby beanie hat for a stylish finish. This charming gift can also be personalised with baby's name for an extra special keepsake! Please checkout the full product description for our hat sizing guide! This truly magical Pink Baby Pom Hat will make a cute and essential addition to every baby girl's winter wardrobe. Featuring a pink baby beanie hat couple with a large pink pom. 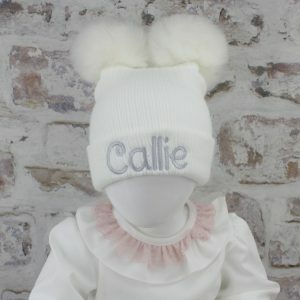 This gorgeous hat can also be personalised with your little girl's name for a memorable keepsake. Please checkout the full product description for our hat's size measurements!